1/31: Amity Conclave No. 98 Improved Order of Heptasophs installed Morris Fogel as a Sentinel. 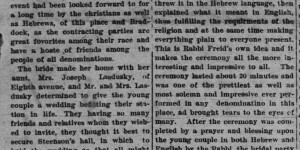 2/12: The annual Hebrew ball was held, bringing together Jews and non-Jews in support of the congregation’s effort to build a synagogue. 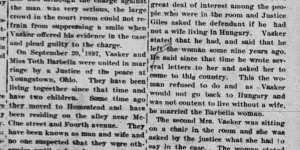 4/8: “At a hearing before George W. Giles Saturday evening in the case of John Vasker, who was charged by Adolph Hepps with adultery, quite a complicated state of affairs was brought to light…A few days ago…a mean came to Mr. Hepps and stated that Vasker had a wife living in the old country. Hepps then went before Justice Giles and made the information charging adultery…” Read the article in the slideshow below to discover that John Vasker isn’t the only person in the case with more than one spouse! 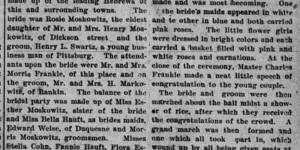 6/12: In the arrangements for the annual businessmen’s picnic, for the first time members of the Jewish community were involved in the planning. Joseph Lasdusky was named the ticket receiver, and the general committee included Samuel Markowitz and Adolph Hepps. 9/12: Twice in a year! Last year, this little boy was knocked out when a stone was thrown at him! 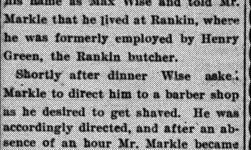 Jacob Marauz (sic), of Heisel Street, Had His Forehead Cut. 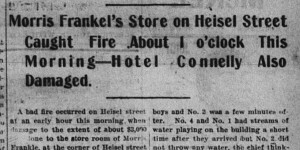 A boys’ quarrel resulted quite disastrously for Jacob Maranz, the little son of Samuel Maranz, the Heisel street hotel proprietor yesterday afternoon, after the boy had came home from school. It appears that he was dismissed from school before the pupils in the Hungarian school at the corner of Third avenue and Dickson street and went down there to play with some other children. While they were going along the street the Hungarian school was dismissed and young Maranz got into an altercation with some of the boys of the school. The end of the matter came when one of the boys picked up a brick which was lying on the pavement and threw it at young Maranz. The brick struck the boy on the forehead and inflicted as an ugly gash. He was rendered semi-unconscious by the blow and was taken by his companions to the office of Dr. Kimmel Rauch on Dickson street, where several stitches were put in the incision. The boy was afterward removed to his home. The injury was a very bad one and young Maranz suffered a great deal of pain last night. It is thought there will be several suits entered against the boys who were engaged in the quarrel with young Maranz. 10/5: One thing that unites boys of all backgrounds — prowess in sports! This game was played during Chol HaMo’ed Sukkot. 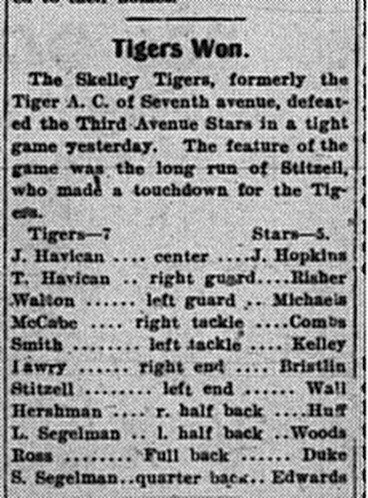 10/5/1901: L. Segelman and S. Segelman were on the winning football team! 11/27: The committee for the upcoming business men’s banquet included Morris Half. 5/23: Homestead High School graduated its largest class yet – 18 members including 4 boys and 14 girls, one of whom was Minnie Segelman! 6/4: Homestead High School selected its teachers for the coming year, and one was Rose Skirboll, recent graduate of teaching college! 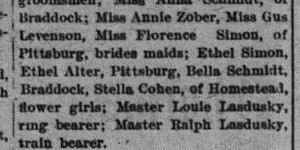 6/15: Seven of the 1901 high school graduates passed the (entrance?) examinations at the California State Normal School, one of whom was Minnie Segelman. 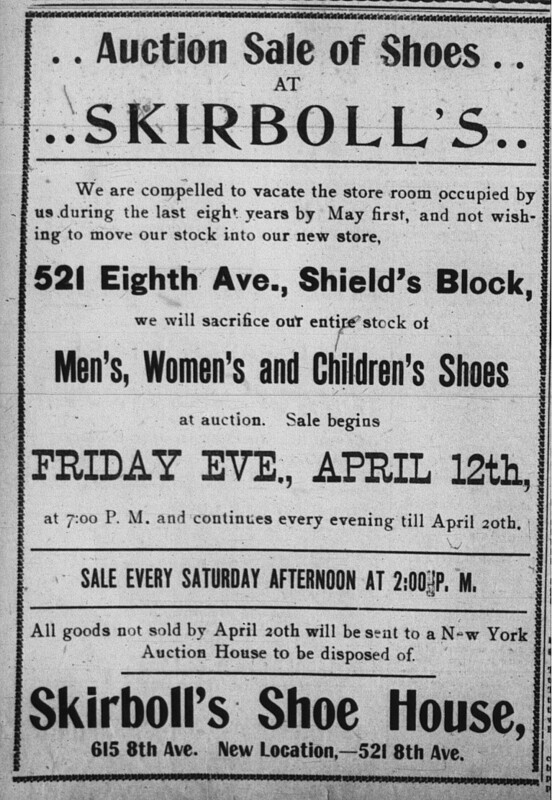 4/4: “Philip Cohen (sic), the merchant tailor, has moved his large stock of new spring dress goods to 349 Eight avenue, and will carry on his well established business on a more extensive scale, he being the leader in styles and fashions in tailor-made suits in the town, and is making a specialty of new spring suits. He also carries a full line of gent’s furnishings and ready-made clothing.” 4/20 was the day he opened in the new location, with a couple articles elaborating on the news. 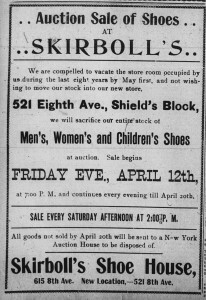 12/23: Half Bros. leased three store rooms in the Homestead Realty Company’s building. I don’t know about you, but this is the year I’ve been waiting for! 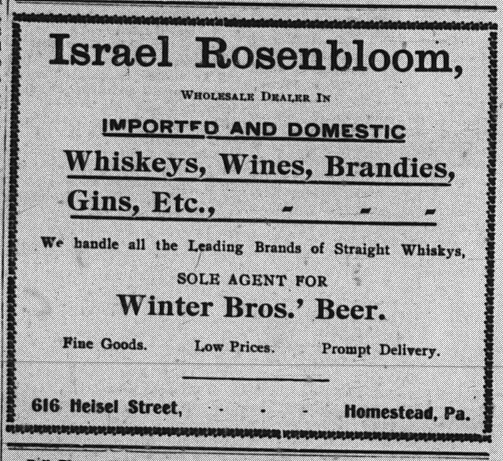 5/8/1901: Ad for new liquor wholesaler Israel Rosenbloom! He was out of business by November, though I’m not sure when or why. 2/23: The list of license applicants came out, and it included my great-grandfather, Bernhard Hepps, No. 404 Dickson street for the first time, as well as perennial applicant Henry Moskowitz, No. 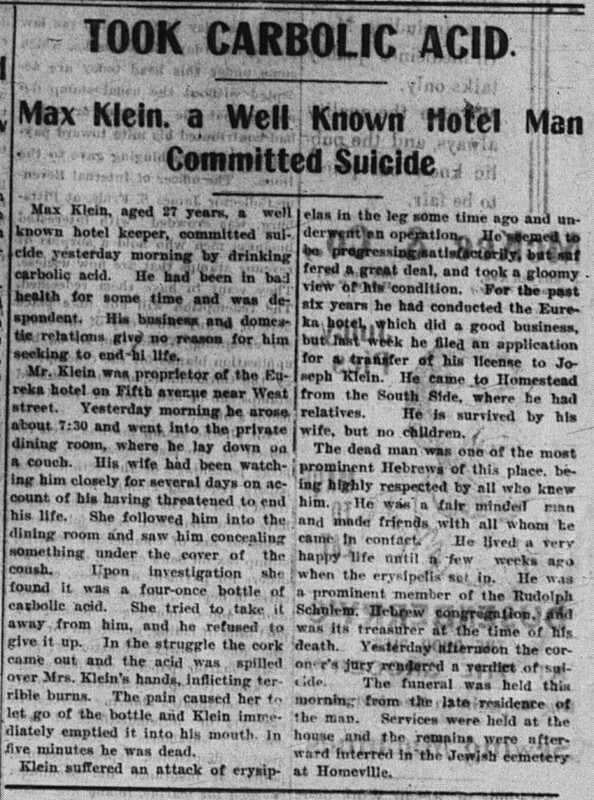 611 Eighth avenue, and Max Klein, the already-licensed proprietor of the Eureka Hotel at Nos. 106 and 108 Fifth. 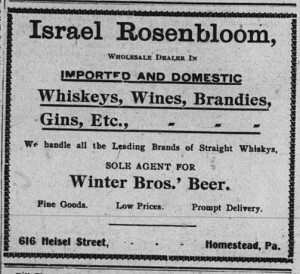 3/16: Wholesale applicants included Israel Rosenbloom, No. 616 Heisel street, and Herman Markowitz, No. 206 Sixth avenue. Overall there was an increase in applicants, “the increase being due to the general prosperity prevailing” (3/17). 4/1: A whopping sixty-one licenses were granted in Homestead. Only six applicants were refused. All of our retail and wholesale applicants were accepted, including my great-grandfather on his first try! Strangely, unlikely all the other years where they analyzed the results in some detail, I could find no commentary on why so many licenses had been granted and what the town thought of that. 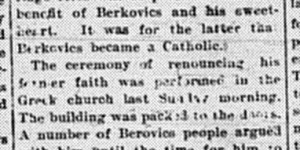 4/26: The newspaper corrected the record and straightened out the circumstances, which required Viess to leave the premises by 5/1. 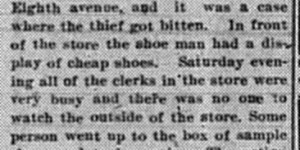 8/30: Samuel Markle, “a former well known Homestead man” who was “proprietor of the Philadelphia Bargain Store” was swindled by his clerk at his current meat market in East Pittsburg. Story below. 9/20: “Yesterday morning the Munhall garbage ordinance was again violated. 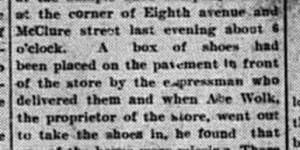 I. S. Grossman and Joe Bott were burning rubbish on the Carnegie property along Eighth avenue and Officer Cosgrove came along and placed them under arrest. They went to Justice Giles’ office nearby an were given a hearing, at which they paid a fine of $1 and costs.” An in the middle of the Days of Awe, no less! 11/22: “William Rosenthal, of Duquesne, was given a hearing last evening before Justice George W. Giles on a charge of fraud preferred by Samuel Markowitz, of this place. In the information it was alleged that the defendant purchased some goods of the plaintiff and gave a check in payment for them. Markowitz claimed that when he presented the check at the First National bank of Duquesne, he was refused payment for Rosenthal had no money in the bank. After the evidence had been offered Justice Giles held Rosenthal for court on $300 ($360?) bail. The man furnished the necessary bond. 12/14: Distressing headline! “Train Crashed into Wagon. Another Grade Crossing Accident Last Evening. P.V. 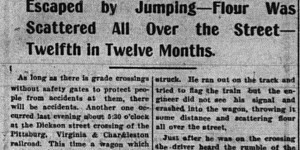 & C. Engine Struck a Wagon Belonging to Max Markowitz–Driver Escaped by Jumping–Flour Was Scattered All Over the Street–Twelfth in Twelve Months.” Read all about it in the slideshow below. 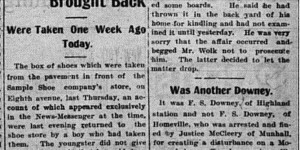 3/13: “Morris, son of Morris Frankle, of Heisel street, is on the sick list.” They must mean Charles Frankle is sick. Bad year for Frankel — first his fire, now this! According to Dr. Google fatal complications were likely with erysipelas in 30% of cases before antibiotics. 7/5: It would take 76 years for the the pun in the headline of this article to become hilarious. The injuries related were not so hilarious, however. The Dark Side of the Fourth. Many Accidents Occurred During the Celebration. Sam Fogle, little boy who resides on Heisel street. Was firing off a cannon cracker and held it too long in his hand. The injury was a serious one. What is it with Jewish weddings getting such extravagant news coverage suddenly?! 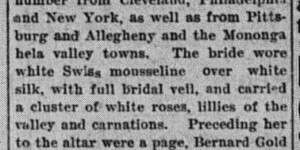 5/23: “Abe Blattner, a well known young business man of Braddock, was here yesterday afternoon calling on friends.” He is the brother-in-law of Ignatz Fox. 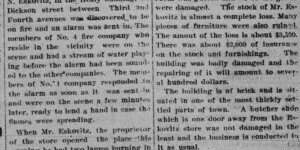 2/26/1901: A bad fire destroys Morris Frankel‘s store room. 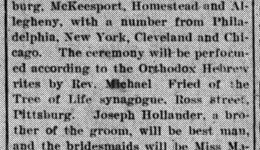 2/27/1901: The Fried-Hollander wedding in review. 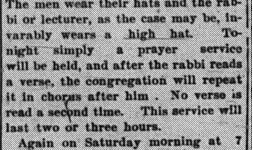 4/8/1901: About the only person in this case who is not an adulterer is Adolph Hepps! 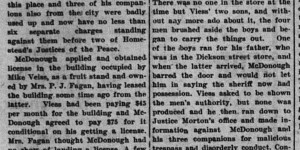 4/25/1901: Through a very complicated set of circumstances, Mike Viess‘s landlady tried to evict him, and his family fought back. 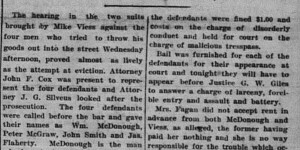 4/26/1901: A follow-up on the Mike Viess eviction situation showed that the circumstances were more straightforward than previously supposed. The amount of coverage of the Jewish holidays is at an all-time high this year! 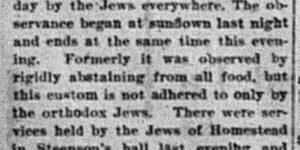 6/13, 7/26: Articles were published about building the new synagogue! 7/26: Work started on the synagogue yesterday! Shame about the weather — the evening was the hottest night in five years. 8/18: On this day the cornerstone of the Ammon street synagogue was laid. Articles here! 8/30: The synagogue’s new rabbi was announced! 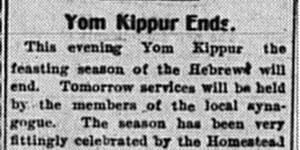 From 8/31-10/5 the paper published six articles explaining Rosh Hashana, Yom Kippur, and (sort of) Sukkot to their readers. They’re all in the slideshow below. 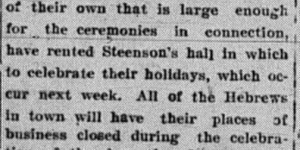 The interesting part is that they say that the community rented Steenson’s Hall, since they don’t yet have a place of their own, and they will be lead by their new rabbi. 9/9: An I.O.B.B Lodge, #516, was established in Braddock. Fifty members joined. Today we know this organization as the B’nai B’rith. 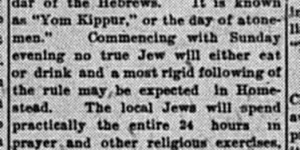 12/1, 12/4: The seats at the new shul were sold, and for some reason the newspaper reported on this in some detail! 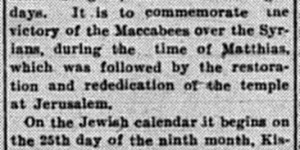 12/7: A brief article about Chanukah was published (also in the slideshow). 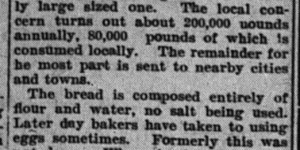 3/19/1901: This Passover article explains matzah in some detail, mentioning the “local Jewish Ghetto district,” which I think is the Hill District? 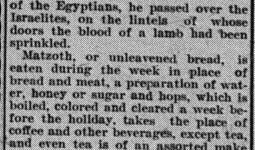 4/1/1901: This article describes the Passover observances in some detail. 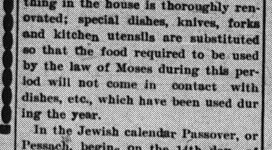 4/4/1901: This article, published Erev Pesach, gave the readers one last primer on how Passover is observed. 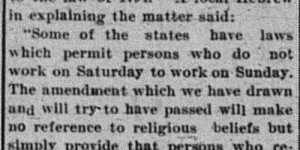 7/29/1901: A state-wide movement to alter the blue laws. 9/23: Today is YK. You can’t shop at Jewish stories. Sorry. 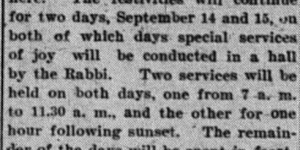 10/5/1901: Judging by the date, they must mean Sukkot.